Lopez Moreda discussed the company’s tech platform roadmap and added some insight into how they designed personalised customer experiences for their many customer personas. The session began with a frank slide about the historical state of GE Healthcare Life Sciences infrastructure and the need for digital transformation. This breaks down into three areas – customer experience, system interaction and fragmented tech. Customer experience was hampered by non-targeted and non-responsive content, as well as poor content discovery. Multi-system interaction led to a disconnected experience with restricted marketing automation. Fragmented technology ecosystems were characterised by monolithic and customized systems, no support for multiple websites and low insights from marketing efforts. From a stakeholder view, this need for digital transformation was manifest as a variety of challenges. Customers were dealing with disconnected messaging, non-relevant and static content, multiple logins and an overall lack of contextual awareness. Marketers were just as hampered, by low community participation, few commercial insights and no personalisation capability. Content editors had no unified interface to rely on, were encountering duplicate content issues and an inability to link content with products. Lastly, developers were hindered by huge start-up time, a lack of design principles, content separation and an arduous build and deploy process. In a humorous aside, Lopez Moreda even admitted GE Healthcare Life Sciences was using Lotus Notes until recently. In order to address some of these challenges GE and their partners at EPAM looked to Marketo, Salesforce and Sitecore, allowing them to link together behavioural and sales data. Lopez Moreda described how GE’s marketers are now aware when a prospect organisation comes back to one of the Life Sciences’ websites, even if a call-to-action form isn’t filled out. The sales team can now see this information and prioritise their own outreach accordingly. 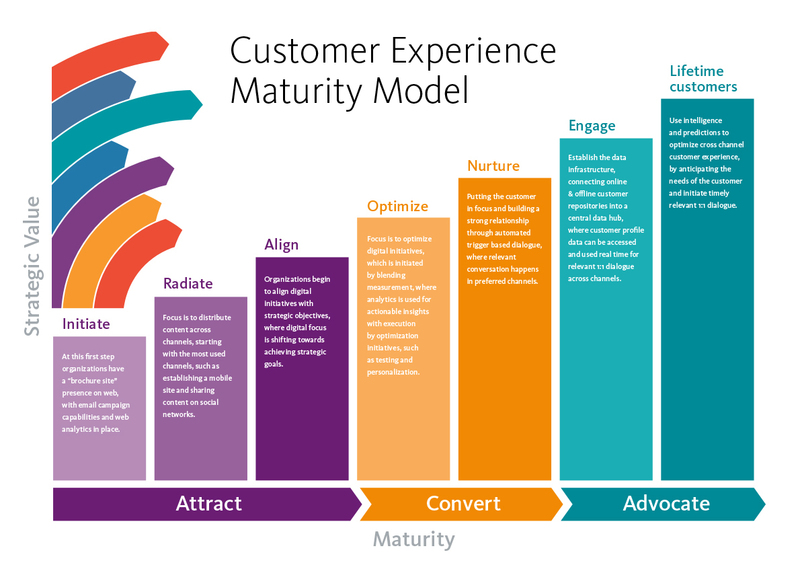 In order to create a roadmap for platform integration and content personalisation, Lopez Moreda referred to a customer experience maturity model by Petersen, Person and Nash (shown below). Life Sciences sits somewhere in the middle of this model, with its digital transformation given the work of aligning channels, optimising and testing. In order to improve personalisation capability, the GE team began by sketching out personas, customer needs and journeys. From this came business KPIs, content planning, consideration of implicit versus explicit personalisation, and finally digital goals. However, Lopez Moreda pointed out that this was not necessarily a linear process and needed multiple revisions, with a particular bottleneck encountered when creating lots of different content for each persona. The hope is that further down the line more of this content will be created dynamically or even using some form of machine learning. Sitecore, Life Sciences’ personalisation software, enabled three types of personalisation, as shown in the slide below – rules-based (keyword and campaign driven), predictive (using rich behavioural data) and connected (integrated with CRM). Lopez Moreda discussed how though this slide is conceptually quite easy to understand, it wasn’t easy for IT to integrate these interactions. Part of defining customer journeys was a process Lopez Moreda called digital relevancy mapping. The grid below was used for each of four defined segments, in order to align content and goals to customer journey stage. Once marketing goals had been finalised, they were weighted, with actions such as requesting a quote given heaviest value weighting and the act of downloading a document at the other end of the value scale. Other actions/goals included joining a loyalty club, registering for a webinar, asking an expert, signing up for email updates and updating your account. The outcomes of platform integration and content personalisation were plentiful and addressed some of the key stakeholder concerns. The customer experience now benefits from responsive content delivery, a unified experience on all channels and connected backend processes. Best-of-breed systems have been integrated using an API approach, with Sitecore and Marketo complementing each other. Insights are made available to sales teams. Community participation has been enabled through new features and collaborations tools. Though examples of personalisation are fairly straightforward, such as offering different content to logged in loyalty club members, these sympathetic and reliable customer experiences are the upshot of much work on platform integration and journey planning.